What is it? Swapping music, movies, games, and other media with other users on a local network or peer-to-peer (P2P) program online. 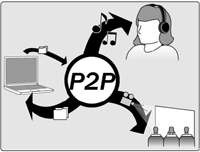 Examples of P2P programs include Kazaa, Morpheus, and Napster. What risks are involved? In addition to downloading viruses that shared files could contain, you could be breaking national copyright laws. Thus, not only might you infect your computer, you might also put yourselft at risk for lawsuits and hefty fines. You may also be downloading spyware-- software that gathers personal information about you without your knowledge, allows hackers to access your personal files and programs, and may put you at risk for identity theft. Keep your anti-virus program updated and install the latest security patches on your operating system. Use freeware and shareware only from sources that you trust. Scan anything with your anti-virus software before installing it on your computer. Be wary of executable (.exe) files since they install immediately on your computer. What is UC Davis doing to protect me? The campus offers inexpensive anti-virus software, available for download via the ?UCD Resources? tab in MyUCDavis. Legally, UC Davis can't protect you if a copyright-holder sues you for trading or downloading their property (songs, movies, software, etc.). It is your legal responsibility to respect copyright agreements on file-sharing networks (see the UC's copyright education Web site at www.universityofcalifornia.edu/copyright/).